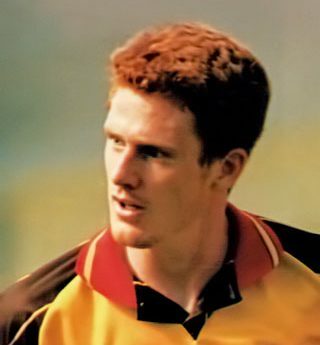 Craig joined the club on a loan deal from Nottingham Forest in 1997, making his debut against Luton Town. He went on to make fifteen appearances for the club. Now a coach at Nottingham Forest, Craig spoke to Watford Legends in 2011. Hi Craig, thanks for talking to Watford Legends. How did your loan move from Forest to Watford come about? Stuart Pearce was in charge at Forest at the time and he said I could go out to get some football. Kenny Jackett was the Watford manager at the time and Graham Taylor was upstairs. I was at the club with the likes of Clint Easton, Kevin Phillips and Keith Millen and overall it was a good side. Craig Ramage was there as well of course, he was a lad! How did you settle in to the club? It was great; I used to travel down with a few of the other lads which helped. Alec Chamberlain, Craig Ramage, Devon White and me would all come down together. Devon only lived round the corner from me, Rammer wasn’t far away and Alec was in Northampton. We used to leave at 8 to then be at training by about half 9. It was a good fun and it helped having other people to do the journey with you. I have actually been doing a bit of coaching at Stoke City this year and Ramage has been doing some with me; he keeps telling these little stories about how he used to look after me – he just makes them all up! Yes I did. I was still young and learning the game. Kenny had obviously come through the ranks at Watford and knew the club inside out. He had been looking after the youth team before getting the first team as well so he knew the likes of Clint Easton and Paul Robinson really well. I remember one game where we were 3-0 up at home to York I think it was. York had a lad whose name was Stephenson playing on the wing and he was quite tricky, but we got to half time 3-0 and comfortable. I got taken off at half time, GT had come down for the second half and he asked why I had been taken off but I had to tell him I didn’t know why as that was the truth. So sometimes it felt like I had been doing something wrong as I was still young and I wasn’t used to coming off for the sake of coming off. You made your debut against L***n, what was that like? Yes it was a Monday night game that finished 0-0 at their place. It was weird because I didn’t know the rivalry. I remember playing on the left wing for that game. I remember parts of the game but I don’t think it was a very entertaining game to be honest. To make your debut in a derby, and now I know there is quite a bit of rivalry to that game, it was good to be part of. We have spoken to players before that were not natives of Watford and they have said they were surprised by the intensity of the rivalry between us and L***n, were you surprised by it? Yes I was. I had also been on loan at Gillingham that season and made my debut against Millwall and I didn’t know that Millwall was their derby game. That was a full house and it was intense, much the same as it was against L***n so I could handle it and it was good to be part of. I think I have still got a video of it somewhere but it really was a boring game! You had two spells at the club, with a month’s break in the middle – what was the reason for the break? Yes I did. I arrived having already picked up a few bookings. There was a month that there were a couple of cup games, which I was cup tied for, and one league game which I was suspended for. So for that month I went back to Forest before coming back for another six weeks. I remember the last game of the season when we were playing away at Burnley and Kenny decided not to play me. As it was the last game he went with youth and put Robbo at left back and Clint at left wing. We got smashed something like 5-0 and I remember being thankful that I wasn’t playing in the end! You are now playing for Forest Green Rovers in the Conference, are you enjoying it? Yes I came here on loan at first at the end of last season playing at centre half. This season I went back as a player coach, it has turned out to be more of a playing role as I want to get on with my football and we have struggled for results a bit. At the moment I am not playing and as with any other player I am frustrated with that. Why are you not playing? Is it down to injury or form? I got concussed in a game six weeks ago. Another lad came in and he done well to be fair to him. I’ve bit parts to play since then but I am mainly starting on the bench and waiting for my chance to get my place back. You mentioned earlier that you do some coaching, would you like to go into that full time when you hang your boots up? Yes I would. I am doing my ‘A’ license in the summer. Like I said I have done a bit with Stoke already and I am hoping that become a few more hours and then who knows where it will end up? I’ve been looking after the under 15’s. I was doing it with Rammer at the start of the season but he got moved to the under 16’s after a while. It is certainly interesting. Craig is still as confident as ever! How can Ramage teach kids how to play when he would never do any running in his playing days?! I know, tell me about it! He will tell you players like him don’t need to run! It is stuff like this that makes me want to continue in football, I would miss the football banter and the fun you can have. Thanks for talking with us Craig, and good luck for the rest of your career.